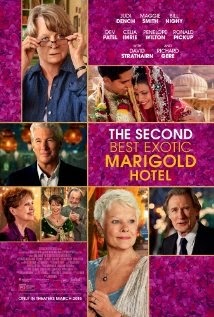 Many people are saying The Second Best Exotic Marigold Hotel is even better than the first. Having now seen both (though I didn't review the first), I felt the first was a little funnier but the second is still a strong film that allows you to enjoy these characters all over again. Presumably, if you're reading this you've seen the first film and are familiar with the characters and story thus far. All the major characters are back along with a couple of new guests played by Richard Gere and Tamsin Greig. The basic story is that hotel proprietor, Sonny (Dev Patel), has plans to create a Second Best Exotic Marigold Hotel since the first has been running at capacity for what I assume is at least the best part of a year, since his wedding is also fast approaching. The movie opens with Sonny, and former resident turned hotel manager, Muriel (Maggie Smith), seeking out investment dollars from a fairly major player in the same field. The investor mentions that they'll send one of their people out to inspect the hotel. Comedy ensues as Sonny suspects a new guest to be a hotel inspector in undercover mode. Along the journey we also get to explore many of the relationships established in the first film, seeing them progress and grow in different ways. Overall it's as good an ensemble piece as the first film. All the characters seem to get about the same amount of screen time with no one really stealing the show. You would expect Richard Gere, being part of the draw to see this film, would have a lot more to do but he blends in to the cast well and is given about the same amount of time to tell his part of the story. There are definitely funny moments through out but you'll probably leave the theater feeling more like you've seen a relationships drama with humor scattered through out than a straight up comedy. To me it's almost a 'slice of life' piece that could easily be followed up with another chapter. There's still plenty more story that could be told. If you enjoyed the first movie then you'll almost certainly enjoy this. The main story does keep you guessing just a little about Sonny's instincts and it's a chance to revisit some old friends to see how they're doing.